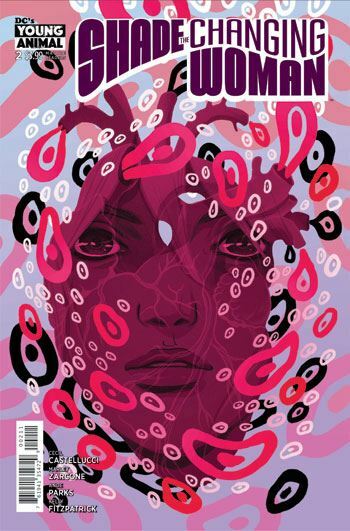 Ok, I guess first of all I have to admit that I am really not too clear on what all happens in Shade, the Changing Woman #2. But I wasn’t too concerned about that. For one thing, it’s a second issue, and laying ground work for things to come. For another, the very nature of the series is to be weird and nebulous. And lastly, I had such fun reading the story that I didn’t mind any confusion I felt. Marley Zarcone is so perfectly suited to this title, I really cannot imagine anyone else illustrating Cecil Castelluci’s bizarre tales. That being said, Jamie Coe is no slouch on the back-up story. This time around, the connection between the back-up and the main story is far clearer. Shade and Rac Shade continue to discuss the nature of humanity in their own sort of reality, while we follow other events on Earth, with some of Loma’s friends. Things take a dark turn, as we find out more about the government’s interest in Shade. While on one hand there are not too many big differences between Shade, the Changing Girl and Shade, the Changing Woman, the confidence in the storytelling has definitely increased. The first series was a big risk. Now that risk has paid off, and there is much greater sense of fun to the new book. Shade, the Changing Woman will not be a book for everyone’s tastes. But it isn’t trying to be. The bravura storytelling is its own reward.